A red carpet delicacy, these cream cheese muffins are a muffinized™ Red Velvet cake, perfect for watching the Academy Awards (tonight). The color is rich and red, thanks to the beet powder, which is undetectable by taste. The cream cheese swirled into the batter adds a subtle tang and provides extra moisture. The crumb topping is sweet, sandy, and slightly crunchy – it’s difficult not to pick off each crumb one by one! 1. Preheat oven to 375 F. Spray muffin pan with cooking spray. 2. Crumb Topping– In a medium mixing bowl, add the sugar and flour. Use two forks or a pastry cutter to cut in the butter until you have coarse crumbs; set aside. 3. Cream Cheese Mixture– In a separate medium mixing bowl, combine the cream cheese, sugar, vanilla, and beat with a handheld electric mixer until smooth, or whisk by hand until smooth; set aside. 4. Muffins– In a large mixing bowl, whisk together the flour, sugar, baking powder, and salt; set aside. 5. In a separate medium mixing bowl, whisk together the egg, oil, buttermilk, cocoa powder, and beet powder. 7. 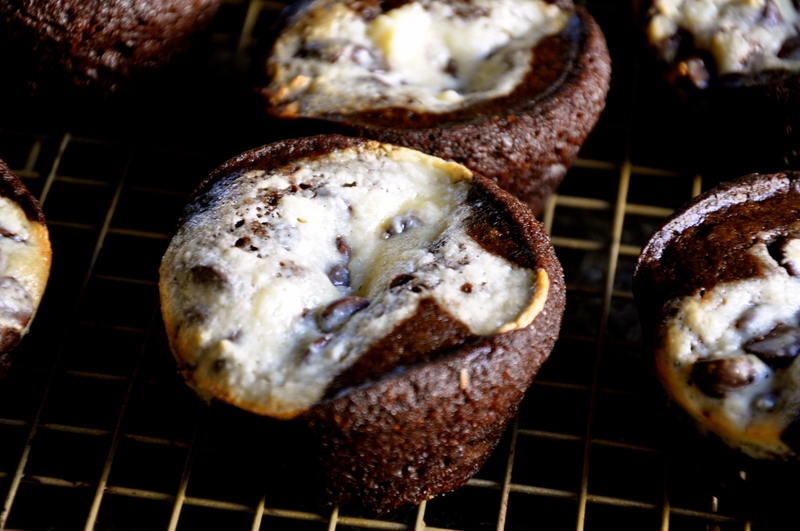 Fold the cream cheese mixture into the muffin batter, being careful not to overmix. Some streaks of cream cheese should remain. 8. 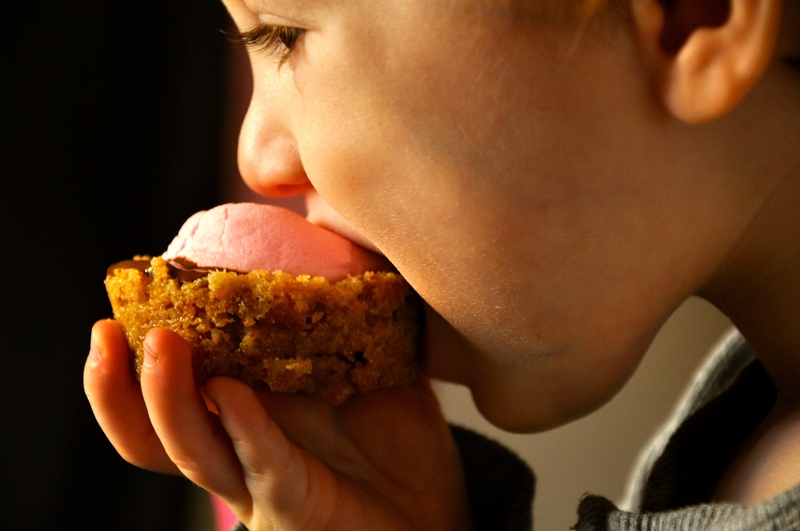 With an ice cream scoop, spoon batter into muffin pan, filling each cavity to two-thirds full. (Do not overfill. 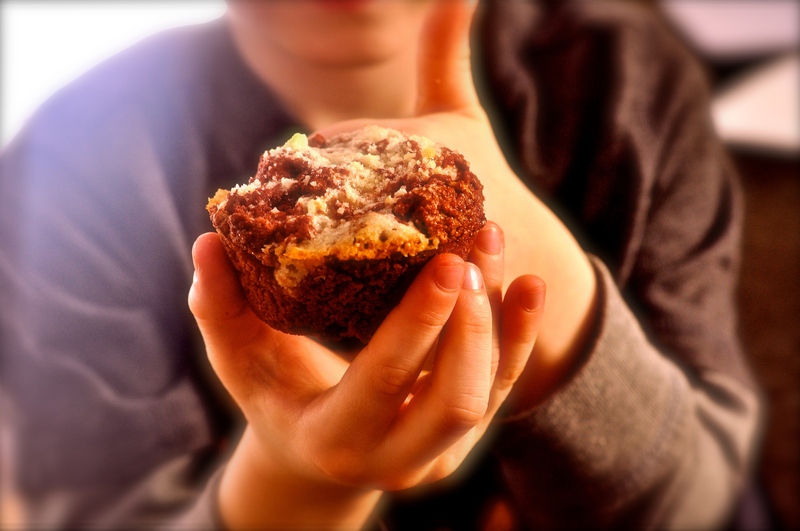 If cavities are too full, the crumb topping will spill onto muffin pan). 9. Evenly sprinkle each muffin with the crumb topping. 10. Bake for about 17 to 19 minutes, or until a knife inserted in the center of a muffin comes out clean. Allow muffins to cool in pan for 5 minutes before transferring to a wire cooling rack to cool completely. Muffins will keep airtight at room temperature for up to 3 days, or in the freezer for up to 4 months. If you’re a Valentine’s Day hater, let me apologize now. Today, I’m going to perpetuate the hype and share s’more. 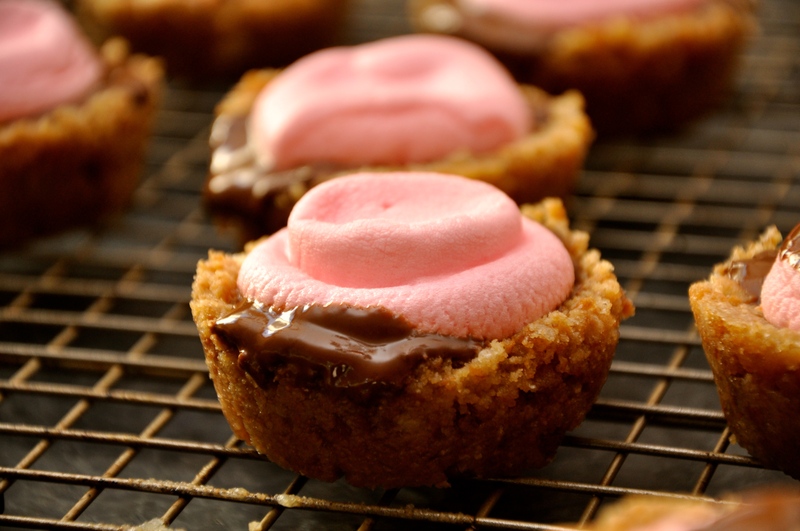 These s’more muffins are pretty in pink and just as delicious as they look. S’mores (the Girl Scout concoction of roasted marshmallow with melted chocolate sandwiched between two pieces of graham crackers) is one part of camping you can re-create in your kitchen without the packing, unpacking, and mosquitos! Still gooey, these are less messy and more contained than the classic sticky sandwich. 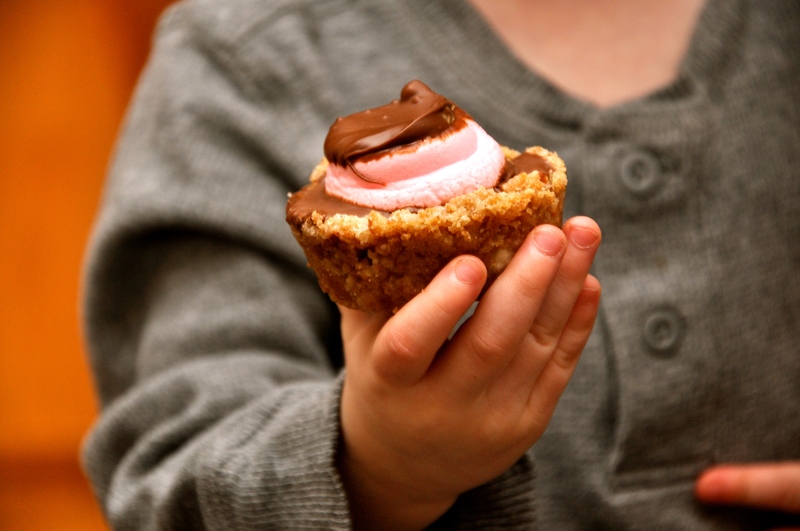 These muffins are the next best thing if you cannot make them by the campfire, in pink, for Valentine’s Day. 1. Preheat oven to 350°F. Grease muffin pan with cooking spray. 2. In a medium-size mixing bowl, combine graham cracker crumbs, powdered sugar and butter. 3. Evenly divide crumb mixture into each cup of a 12-cup muffin pan. Use your finger to press an indent into the center of each muffin cup. 4. Bake 7-10 minutes or until edges are bubbling. Pull out and immediately place one mini chocolate bar on each cup. 5. 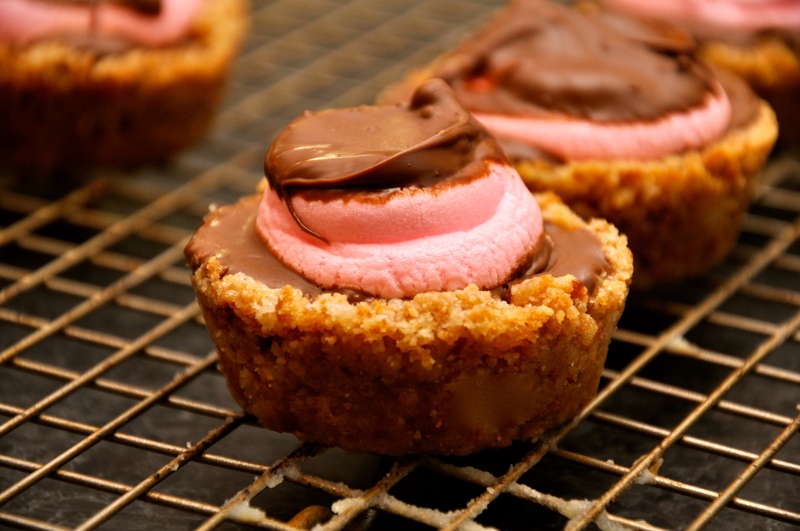 Place one marshmallow vertically in the center of each muffin and push it into the melted chocolate/graham cracker crust. 6. 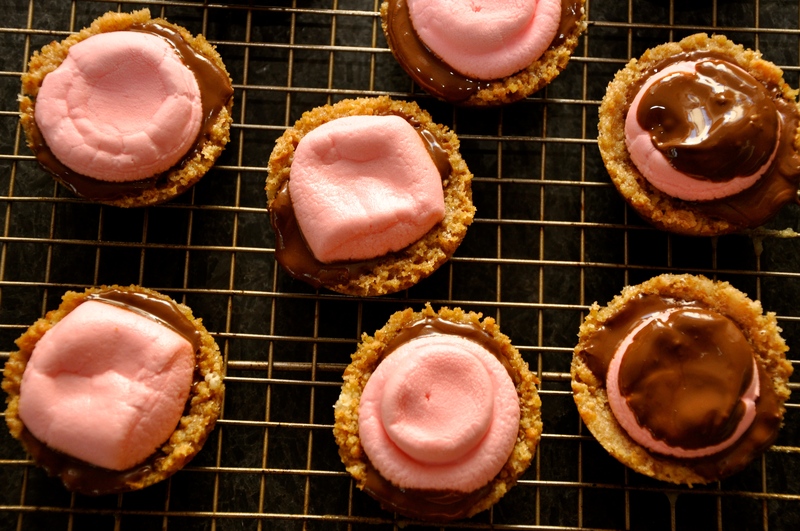 Return muffin pan to oven for 1-2 minutes or until marshmallows are slightly softened. 7. Place muffin pan on a cooling rack for 15 minutes before carefully removing cups from pan. After 5 minutes, gently press marshmallows to flatten them slightly. 8. Transfer muffins to cool completely on wire rack. 9. 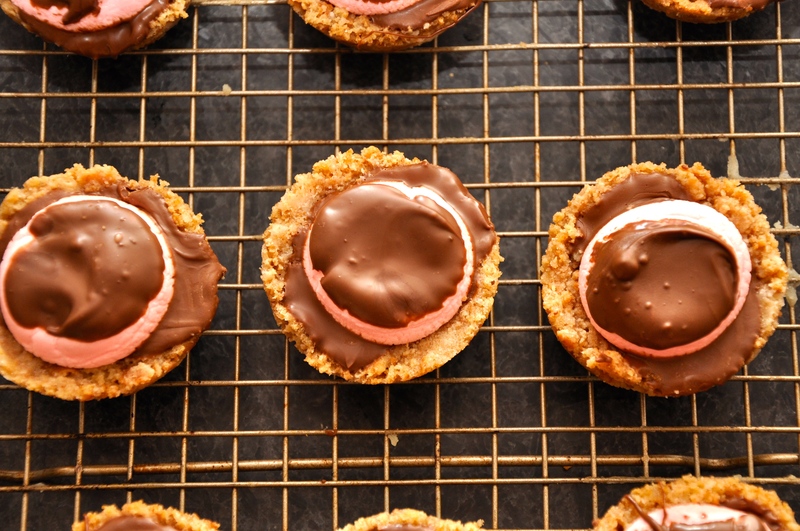 To prepare topping: place milk chocolate in a small bowl. Microwave on high for 1 minute-1 1/2 minutes or until melted and smooth, stirring every 30 seconds. 10. Dip the top of each marshmallow into the melted chocolate. Turn top-side up and let stand until set. Store the cups in a single layer in an airtight container for up to 1 week. This article was featured in Real Woman on February 12, 2015. The idea of Valentine’s Day makes me blanch. We all love love, but some of us are perplexed by the popularity of a national holiday that leaves singles bitter, promotes the exchange of tacky gifts, and encourages children to trade “statements of love.” I, for one, resent the pressure on couples, young and old, to indulge in prix fixe meals that they would not otherwise stomach. I feel so strongly about it that when my older son was 3, I took a stand. His preschool teachers told parents to pack a dozen personalized valentines to give out on the Day of Love. Like most 3-year-olds, my child could not yet write his name, so the task was clearly intended for the parents to transliterate scribbles on cards. I did not enjoy the homework assignment, nor did I appreciate the expectation placed on my preschooler to send so-called-love-notes to children who could not yet read. The director of the preschool rescinded the “assignment,” and the mothers went wild with disapproval. The Chicago moms had no clue that I was the culprit (until now). Regardless of that year’s freedom from insincere Hallmark greetings, I’m still baffled by how second nature it is for today’s youth to swap cheesy Sponge Bob and Spider-Man valentines and for grown men to scurry off to grab the remnants of red roses at the grocery store. I do wonder what I’m missing. But since it feels cynical to shut out the best thing we humans do on Earth (love), I share this recipe, for Valentine’s Day, straight from my heart. 1. Preheat oven to 350 degrees. Grease muffin cups with cooking spray, or line with paper liners. 2. 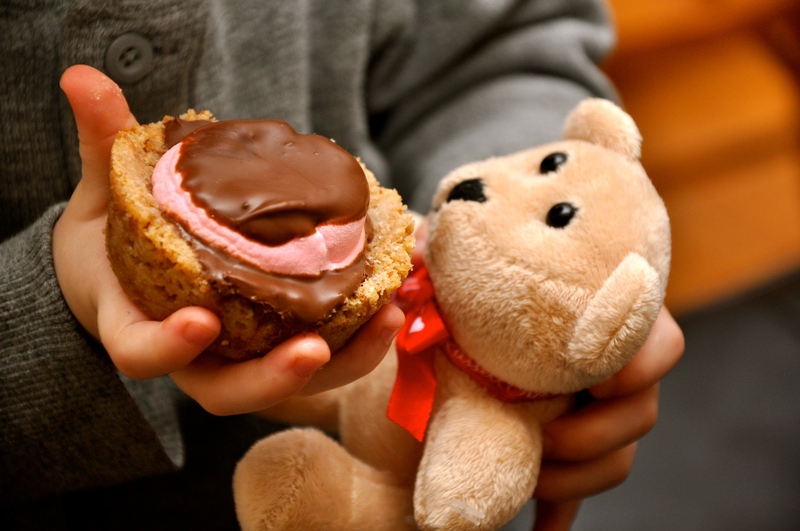 In a large bowl, combine flour, sugar, cocoa, baking soda, and salt. Add water, oil, vinegar, and vanilla. Mix well. 3. For the filling: In a separate mixing bowl, combine cream cheese, sugar, egg, salt, and chocolate chips. Mix well. 4. 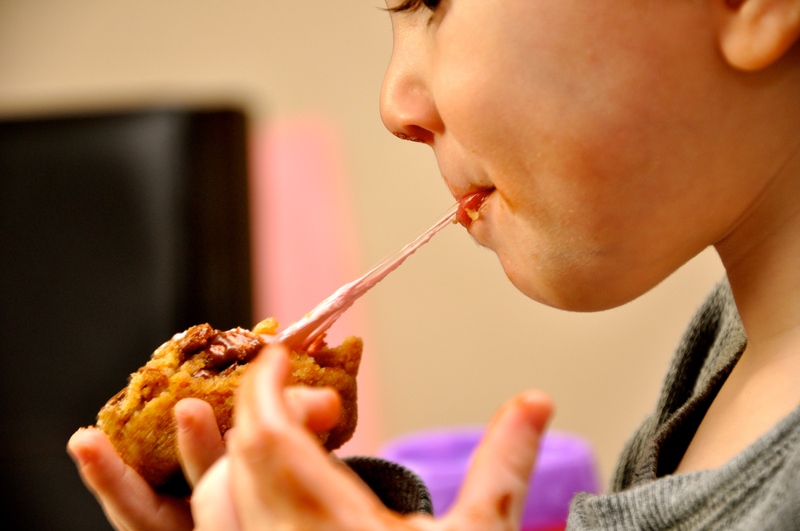 Use an ice cream scoop to spoon batter into muffin cups until half full. 5. 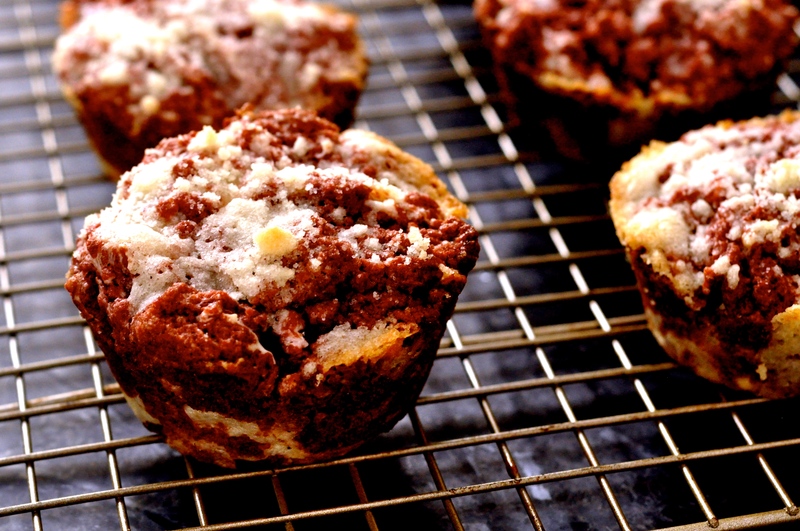 Top each muffin cup with 2 Tbsp of filling. 6. Bake for 25 to 30 minutes. 7. Cool for 10 minutes before removing from pan to place on a wire cooling rack.